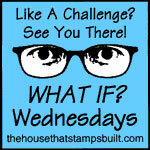 This week at The House that Stamps Built our challenge was to use the inspiration photo. With all the beautiful floral images we have available the only hard part of this challenge was for me to decide which one to use. Ichoose to use 10201-W Flower Power Background as I really felt in the mood to color. Look at all those beautiful flowers - using my Misti I stamped one edge of my white cardstock then turned the cardstock 90 degrees and stamped the same image again. I then used copic markers to color both side the same. The space in the middle worked very nicely for my die cut hello. 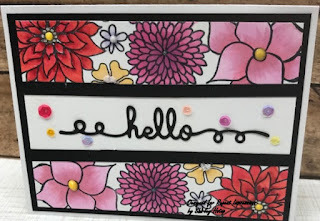 Nice relaxing evening to color, added a few sequins and my card was complete. 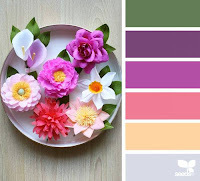 Now it is your turn to make a card or project using the inspiration photo above. So many possibilities on this challenge. You have a full month to enter our challenge. You do not have to use Repeat Impressions stamps you will have two chances to win a $25 gift certificate towards stamps. ow it is your turn to make a card using the challenge of Use a Stencil - and as you can see there are a lot of possibilities for this challenge. You have a full month to enter our challenge to win. 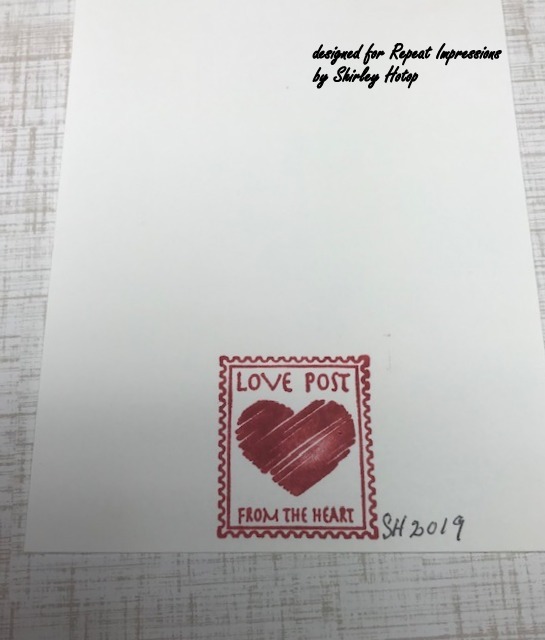 You do not have to use Repeat Impressions stamps but if you do you will be entered twice for the drawing of a $25 gift certificate to Repeat Impressions. 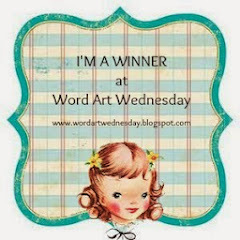 If you look on my right side bar I also have a discounted coupon for you to use when you go shopping at Repeat Impressions. 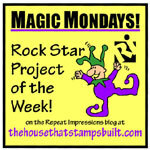 Now why not take a look at our DT Rock Stars for inspiration and to get you started. 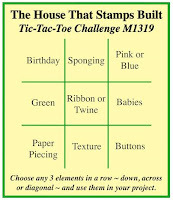 This week the challenge over at The House that Stamps Built one of my favorite challenge is up this week. Tic-Tac-Toe - so many possibilities. I chose to go with the top row across Easter, Washi Tape and Pastel colors. 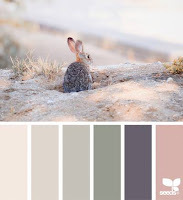 For this challenge I used 920-I Cross Window and 1304-J Beauty of Springtime . 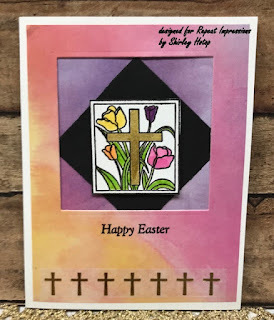 I recently got the Cross Window - and I embossed it in black and then colored with copic markers and a gold gel pen on the cross. I had some watercolor wash DP that I used on the outside of the card, using a die to cut a square in the middle to place my focal image. I mounted it on black - making the focal image stand out. 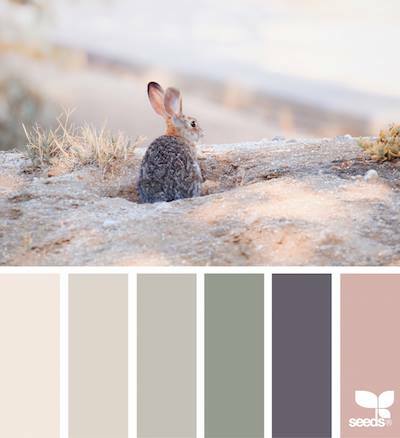 The Beauty of Springtime has a sentiment as well as the Happy Easter - I only used the Happy Easter on my card. My washi tape is the crosses on the bottom of the card. I had gotten this to use on a scrapbook page of my baptism. Worked perfectly. 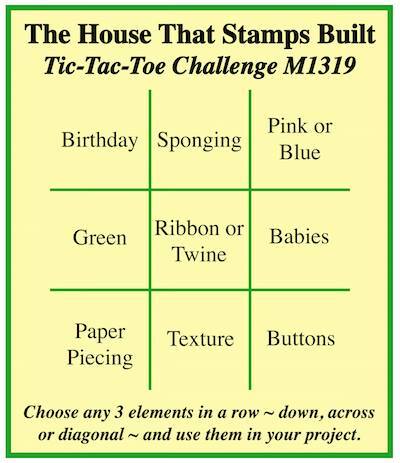 Now it is your turn to make a card using the challenge of Tic-Tac-Toe - and as you can see there are a lot of possibilities for this challenge. You have a full month to enter our challenge to win. 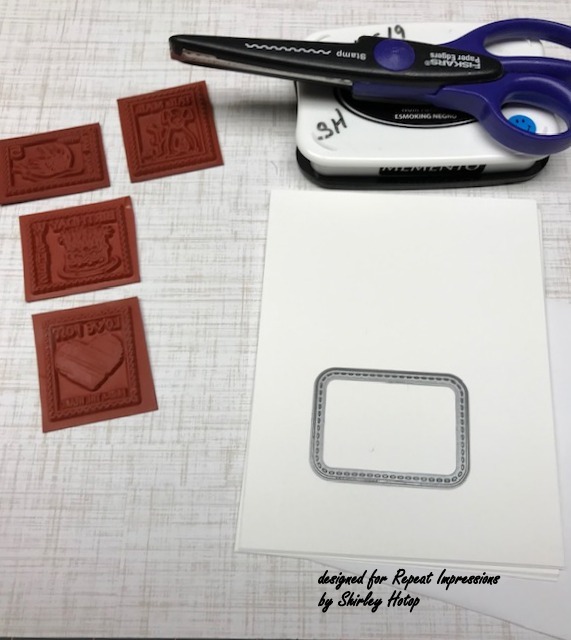 You do not have to use Repeat Impressions stamps but if you do you will be entered twice for the drawing of a $25 gift certificate to Repeat Impressions. 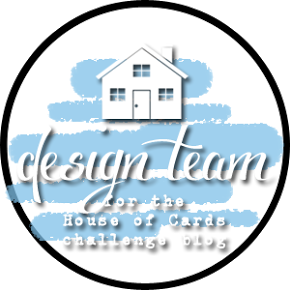 This week I am the designer for our POTW (project of the week) over at The House that Stamps Built. I choose to work with Postoids - well what are postoids - they are a faux stamp - little but fun to work with in several ways. So lets gather some supplies - card stock stamps, ink, envelopes, a pair of postage style scissors (is you have them) and color medium of your choice. 4901-E Snail Mail. After stamping the image I used a stitched die cut to frame it out. Colored with copic markers and used on my card with some flower paper, twine and a little pink heart. If you look closely you can see the tiny elements I used on the snail "ears" or feelers. which I think just adds the perfect amount of bling. 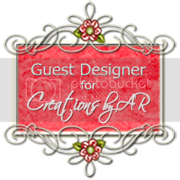 For this example I used it on the back of my card as a "stamped by" and personalizing it with my hand written initials and the year. I used 4903-F Love Post . 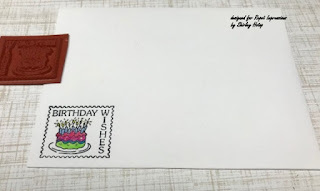 Next up I used 7101-F Birthday Post on the outside of my envelope to wish the recipient a Happy Birthday before the envelope is ever opened. I put it in the left hand corner of my envelope and then colored it with colored pencils. 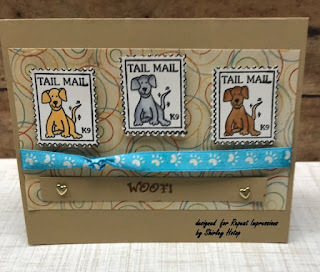 8105-F Tail Mail and 8103-C Woof stamping three images, cutting around them with my postage scissors. I colored each dog a different color using copic markers. A bit of ribbon trim a sentiment and 2 little hearts and card complete. 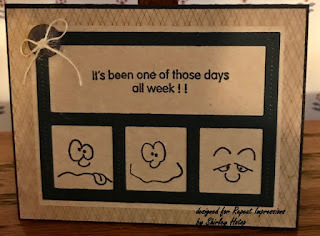 Hope you have enjoyed my projects - I have several more postoids in my collection - and I bet you have some or will put a few of these on your next order. Can't believe it is April already - and I feel spring - birds are singing in the morning, trees are budding, and temps are warmer. 6112-J What do we live as I think we need more kindness in our life. Now it is your turn to make a card using the challenge of Use a Stencil - and as you can see there are a lot of possibilities for this challenge. You have a full month to enter our challenge to win. 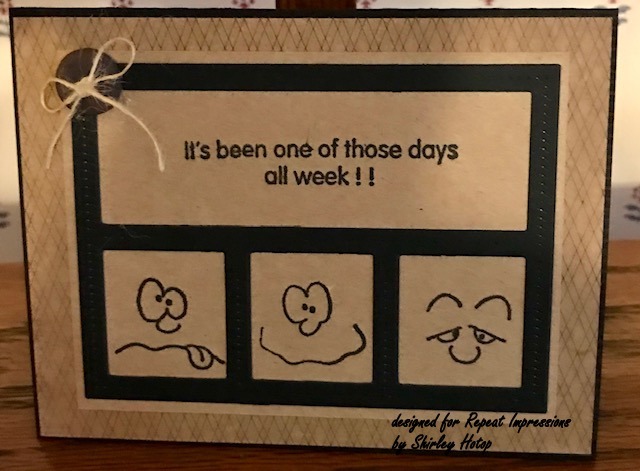 You do not have to use Repeat Impressions stamps but if you do you will be entered twice for the drawing of a $25 gift certificate to Repeat Impressions. 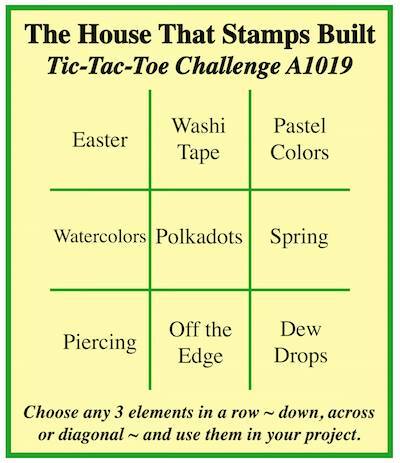 This week over at The House that Stamps Built our challenge is ANYTHING GOES - and I have to say this is my second favorite challenge - my first being Tic-Tac-Toe, I have had these stamps for a while - and they are now officially inked - I had this idea when I saw the frame die cuts that a friend Donna cut for me so that was my inspiration. 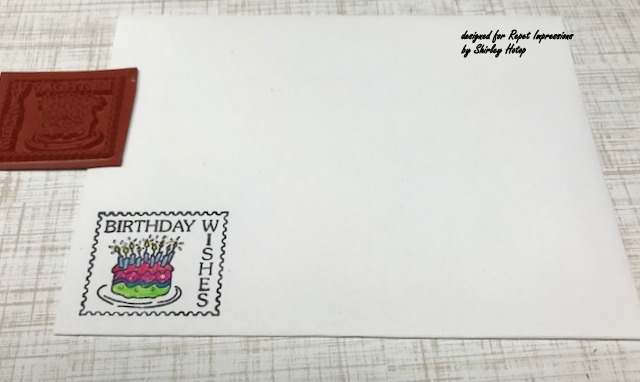 Stamps I used will be listed below. I love the three silly faces - and I already have someone in mine to send this to- my sweet daughter She works for a medical clinic (22 doctors) and she is the certification specialist for all the tests, x-rays, meds, etc. that our insurance companies insist on having. Some days she gets really frustated - especial when she gets a "denial". Well anyway I think this might make her day. 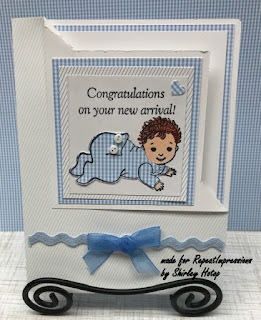 Now it is your turn to make a card using the challenge of Anything Goes - and as you can see there are a lot of possibilities for this challenge. You have a full month to enter our challenge to win. 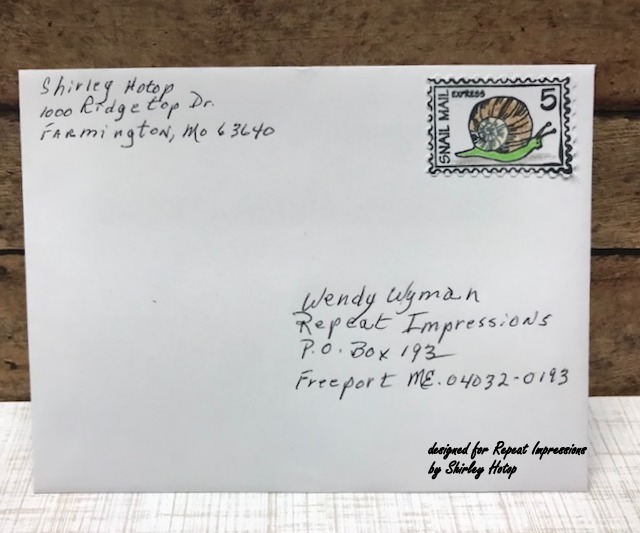 You do not have to use Repeat Impressions stamps but if you do you will be entered twice for the drawing of a $25 gift certificate to Repeat Impressions. Photo inspiration this week over at The House that Stamps Built the above picture was our photo challenge. I went with the colors (which really don't show true to color on this post) and then I really felt it kind of went with the picture as well. 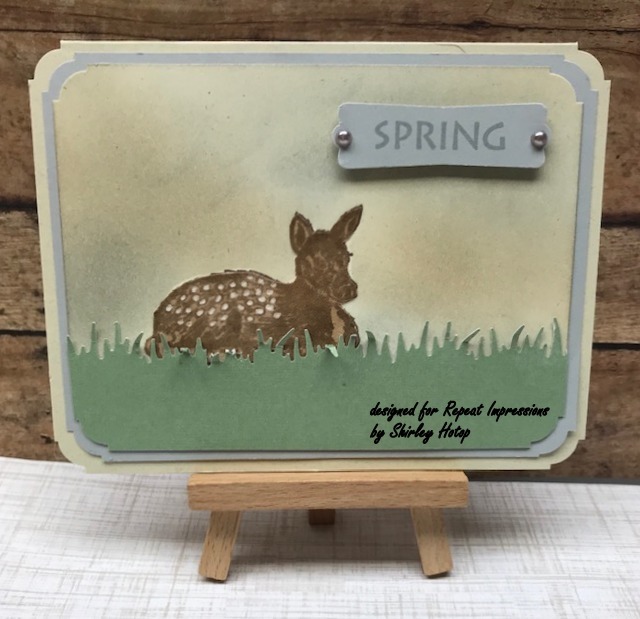 I used 4212I Fawn - I used a piece of soft brown velvet paper and fussy cut him/her out. I then colored in the white spots with a white gel pen - the image is so soft to touch. When we take walks in the park by our house we see a lot of these babies in the spring. I punched out a grass border with a sage green and ruffled the grass a bit. 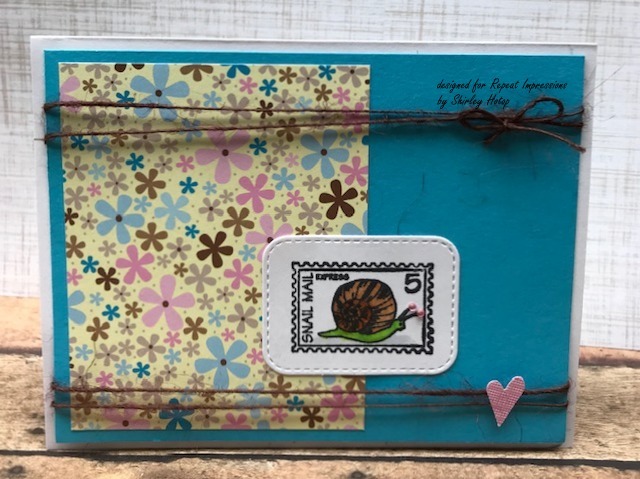 I sponged the sky in grays, and soft browns and for my sentiment I used 1301-F Happy Spring and just used the Spring portion of the stamp. I'm thinking my chemo buddy might enjoy this card. 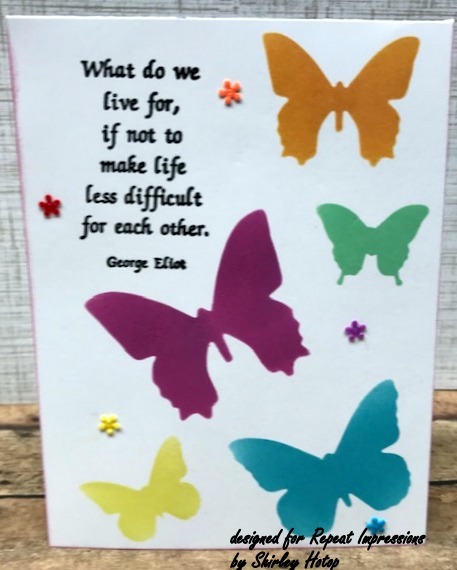 Now it is your turn to make a card using the challenge of Photo Inspiration - and as you can see there are a lot of possibilities for this challenge. You have a full month to enter our challenge to win. 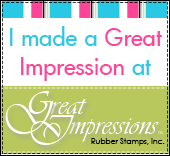 You do not have to use Repeat Impressions stamps but if you do you will be entered twice for the drawing of a $25 gift certificate to Repeat Impressions. 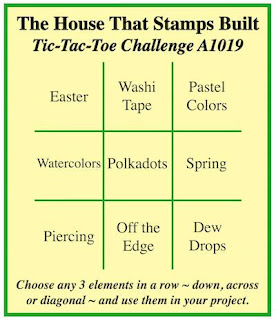 My favorite week of the month at The House that Stamps Built is Tic-Tac-Toe - so many options - I choose to go with right vertical plus paper piecing and ribbon. I went with baby as I never have one when I need it. Now if it is a boy I am all set. I used 4116F New Arrival and 1607I Baby. I went with blue, paper pieced his sleeper with blue gingham, and went with a corner fold card which I have not made in a while, I had to look up the instructions. I had the tiny buttons from a LONG time ago - well when I was making Barbie doll clothes, and now daughter is a grandmother herself so you know how old they are. Some blue rick rack and a bow and complete. 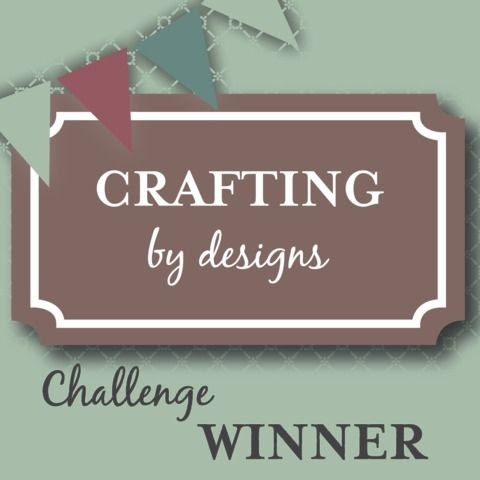 I am an addicted papercrafter that retired from a career in nursing 2 years ago. I am married to my "high school sweetheart" and he loves to fish - leaves me more time to craft. We share our home with 3 big dogs, Bella, CoCo and our newest Buddy and 1 cat Calli. If you don't find me walking the dogs, reading, you will find me in my craft studio.